When it comes to an outstanding dining experience, guests rely on restaurant servers. They are the ones who make guests feel welcome, can explain the menu, serve food, and provide all-around great service from the time guests arrive until they are ready to leave. 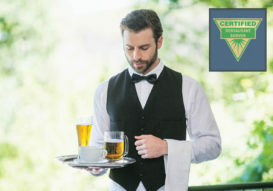 The Certified Restaurant Server designation recognizes the high level of professionalism that is needed to succeed and to bring outstanding service to every guest. Candidates should complete the START for Restaurant Server training to prepare for the certification exam. The training is available in an online package with certification exam for individuals, or in print for group training. START for Restaurant Server is intended for employees/trainees in a classroom setting. It does not require an on-the-job training component. quickSTART for Restaurant Server is intended for on-the-job employee training or for trainees with access to a hands-on learning lab or internship where there are opportunities to perform job tasks. Those who complete the START or quickSTART program for Restaurant Server are prepared to take the Certified Restaurant Server certification exam. The certification exam consists of 30 multiple-choice questions.